Anyways, Jon was more than patient w/ them...finally Steve yelled back "alright, you've had your turn, now please shut up!" Right on Steve! 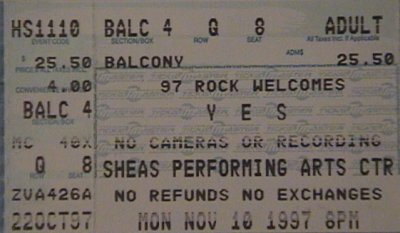 I saw Yes in Buffalo on the 10th. The show was great, much better than when I saw them in Boston. Igor was up in volume and hit all his notes. He also seemed to be more comfortable with the band and visa versa. His organ part in Starship Trooper was very very good. During Howe's acoustic set he played Classical Gas in between portions of the Clap. When did he start playing that? He certainly did not do it in Boston.